3 Jun 2012, 11:16 a.m. This is not exactly a review, but rather a collection of thoughts/complaints about Civ V from both a players' and game design/implementation perspective. First off, the endgame is still slow as molasses: a dozen cities clamour for your directions, dozens of units want to know where to go next. Running the game devolves into a series of trivial and obvious decisions with no real ability to make choices about where your empire is going. The AI is still needlessly belligerent as opposed to self-interested. I was playing a game as the Russians, and was being soundly beaten by the Romans, who had developed nuclear weapons while I was still trying to figure out electricity. The other relevant power left in the game were the Indians. Did they recognise that their only hope of winning was to combine forces with me and take down the Romans? No. They hated me with an utter passion for no conceivable reason. Then, inevitably, the Romans won. One new introduction are city-states, which work as "little players": they stay put and don't found new settlements, and you are supposed to woo them for their affections. The execution is terrible, though: city-states make constant proclamations of their needs, and their needs are monotonous: destroy this other city, build this wonder, repel these barbarians. Reading these proclamations is made mandatory by the game UI - you can't end your turn before you've read that a place on the other side of the world has some new vendetta they'd like you to take care of. And the reward for doing their bidding? A few extra resources. Imperialism did it much better with Minor Nations, a decade ago. Information is hard to get at. For example, when you are selecting a civilisation, or loading the game, you are told what that civ's special units and buildings are. But you're not told anything beyond their name and icon. There is no tooltip or blurb or help link. If you want to know, you have to navigate through the in-game encyclopedia, which is not available from the main menu, but only while a game is running. Fundamentally, why use a 3D engine for a game that's entirely 2D? Yes, it's cool to see the individual units battling one another. But in order to have some overview, you tend to be pretty zoomed out, and hence most of the fight's detail is lost. And this 3D engine takes a lot of power to run. I tend to buy midrange macs and replace them maybe once every six years, so I spend a lot of my time running hardware that's years behind the standard. This makes me like strategy games for their low system requirements. Not so with this one. I have a burn on my left leg from Civ V running both CPUs and the GPU at full blast. What's it doing with all that computation power? Maybe 1% of it must go to actually calculating the game mechanics. The game's fondness for visual transitions makes the whole play experience sluggish. If it wants to show you something, it will leisurely scroll the viewport over. If you call up a city screen, it animates panels sliding in from the sides. More sluggishness: everything takes ages to load. The game takes more than a minute to even start up and wants to show you its intro cinematic every single time. 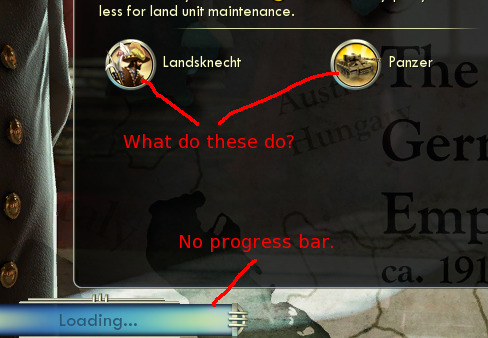 Starting and loading games takes ages too, and there is no progress bar. Another major new component of Civ V is the happiness system. You have to keep your citizens happy, otherwise population growth, and eventually industry, will suffer. But once you end up in the unhappy zone there is often no real way to get out. You need to either harvest more luxury resources, build more happiness-producing buildings, or enter some trade treaty that supplies you with luxuries. Often, none of these avenues are available at all, so, you are just stuck until you have researched a technology that lets you build a new building, or acquired a cultural policy that increases happiness. Unhappiness is generated by population growth, which can be pretty hard to track across your entire empire, again thanks to the lack of easily accessible information and sluggishness of the UI. One big change in the game is that the tile grid is now hexagonal and that military units no longer stack. I actually like these changes: they make combat a lot more tactical. Another introduction are ranged units, which can shoot into non-adjacent tiles. But range calculations are murky and can't be figured out in advance, so you can waste two turns moving and setting up your catapult only to be told the enemy city is not in range. Civ belongs to the sprawling "4X" strategy genre, whose Xes stand for (sigh) "explore, expand, exploit, and exterminate". I confess I am more of a fan of the first three than the last one. Many 4X games are ultimately descendents of war games, and Civ V has definitely returned to its roots there: combat is more complex than ever while other aspects have been simplified, and nearly all civilisations have combat-related bonuses. In conclusion, Civ V is at best an uninspired addition to the series. In terms of UI it's a step backwards. In terms of gameplay it's a shift towards more conflict and less building, which is not that I play this kind of game for. Play Alpha Centauri instead. Or FreeCiv.